Dan Danai said American investment in Israeli start-ups could increase under the new presidential administration. Panel members from left, Alex Kaplun, Avi Lindenbaum, and Joel Presman. Moderator Ofer Levy is in the background. Despite Israel’s small size, and efforts by its outspoken critics to quash it economically, the country’s high-technology industry is booming. The country leads the world in technological innovation per capita, is second to Silicon Valley in concentration of high tech start-up companies, and has more companies listed on the NASDAQ than any country other than the United States and China. In 2015 alone, 1,900 Israeli start-ups were launched and 2016 was on pace to end with even more. “There are more start-up companies founded in Israel in one year than in all of France,” said Alex Kaplun, a New York corporate lawyer specializing in mergers and acquisitions, venture capital, and entrepreneurship law, who represents many Israeli start-up companies. 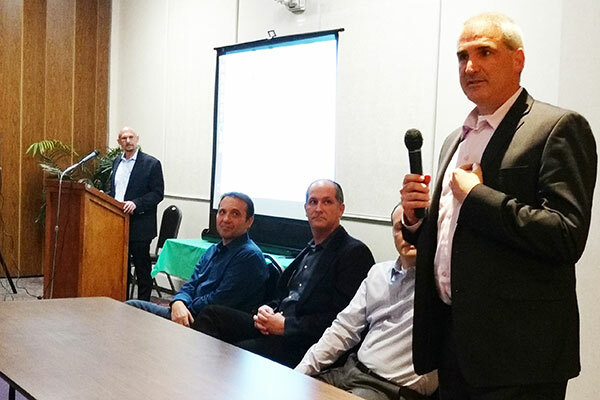 The program, sponsored by the EBJC’s Men’s Club, was moderated by Haifa-born synagogue member Ofer Levy, a graduate of the Technion-Israel Institute of Technology. Levy, a senior financial advisor, said despite “the negative points” voiced by advocates of the anti-Israel Boycott, Divestment, and Sanctions campaign against Israel, the country’s business outlook is getting stronger. That feat is especially remarkable when considering Israel has a vast amount of desert, but has managed to turn that into a positive by developing innovative drip irrigation technology that has helped the nation become a leading exporter of agricultural products. Beyond that, it developed a process to remove salt from the bodies of water surrounding it, recently opening the largest desalinization plant in the world, said Kaplun, and the technology has been exported to other water-starved regions of the world. Kaplun is on the boards of the U.S. Israel Business Council and the American Friends of the Israeli Navy Seals and a visiting professor at the Merage Foundation U.S-Israel Innovation Bridge Program. He said the military backgrounds of Israeli entrepreneurs, influx of Russian immigrants with advanced degrees, and the “Jewish culture” based on talmudic debate, all help foster innovation. Another element of their success comes from the fact that Israel’s office of the chief scientist in the Ministry of Economy develops policy and offers support to encourage development of high-tech entrepreneurships and collaboration nationally and worldwide, per Kaplun. All of this has led to the manufacturing of such products as Intel’s Pentium chips used in computers, and mobile technology used in cell phones, said Kaplun. Avi Lindenbaum, an “angel investor” in Israeli start-ups, called the intellectual property coming out of Israel unbelievable, so much so that international companies, many of them American, are paying huge sums to buy the IP of Israeli entrepreneurs because the Israeli market is not large enough to sustain their business growth. 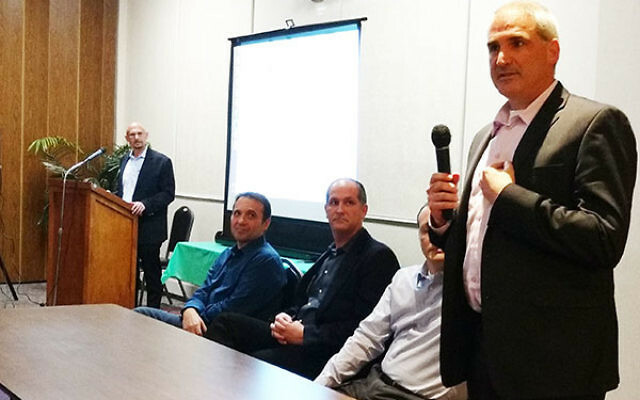 Lindenbaum invests through Kodem Growth Partners, which provides capital and high-level customer introductions with government organizations and multi-national companies in the United States and Europe. He said one of areas Israel has excelled in recent years has been in the development of high-tech security, some of which was used to by the FBI to catch the terrorists in the 2013 Boston Marathon bombing. Joel Presman is founder and general manager of Remarkety USA, which applies big-data and smart algorithms to the e-commerce field and has operations in more than 70 countries. He said that often the only way to develop an Israeli venture is to join forces with a larger enterprise. The American-Israeli tech collaboration could grow even more in the coming years, according to Dan Danai, who heads the U.S.-Israel Desk at BDO, one of the largest global accounting and consulting firms. Danai, who earned his bachelor’s degree at Tel Aviv University, said the new Trump administration could “bode well” for Israeli start-ups by making the U.S. dollar stronger and encourage increased American investment.